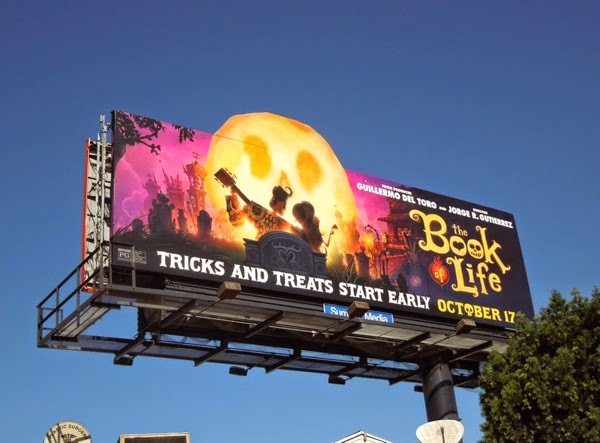 With Halloween fast approaching, here's a movie's advertising campaign that seems to embrace the annual festivities, but has more than a few tricks and treats up its sleeve. Spooky skulls abound in the U.S. this close to Halloween, but in Mexican culture skulls serve as a reminder of the dearly departed and are not so scary. 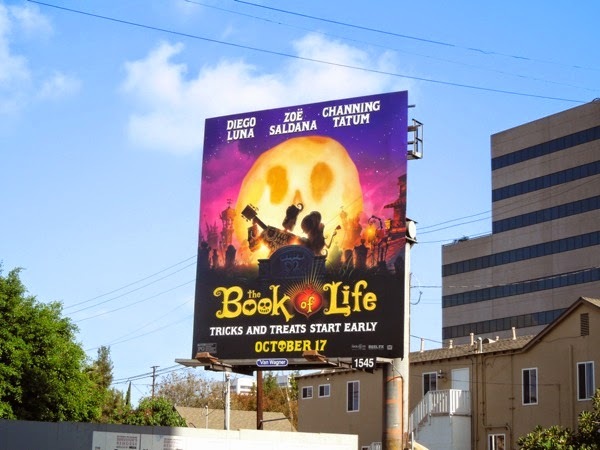 The Book of Life takes place on Mexico's annual celebration of departed family and friends, Día de los Muertos (Day of the Dead) and the vibrant computer-animated tale follows the story of 'Manolo' (voiced by Diego Luna), who's torn between honouring family traditions of becoming a bullfighter and following his own dreams. The soulful young guitar player embarks on a journey spanning three fantastical spirit realms to face his fears, find his true calling and win the heart of his beloved, 'Maria' (Zoe Saldana). 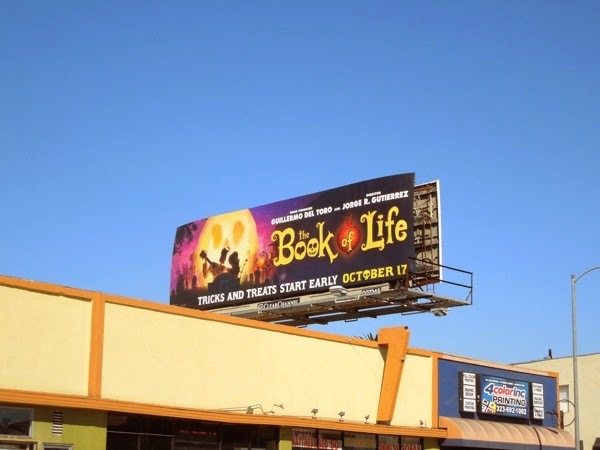 The Book of Life special extension billboard was spied along San Vicente Boulevard, whilst the standard landscape version was snapped along La Cienega Boulevard on September 30, 2014. 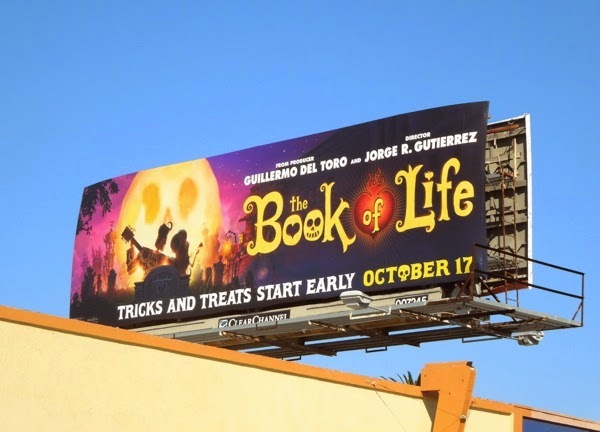 Whatever you'll be celebrating at the end of the month, it looks like this colourful animated movie by Jorge R. Gutierrez be able to transport you to different worlds this October. 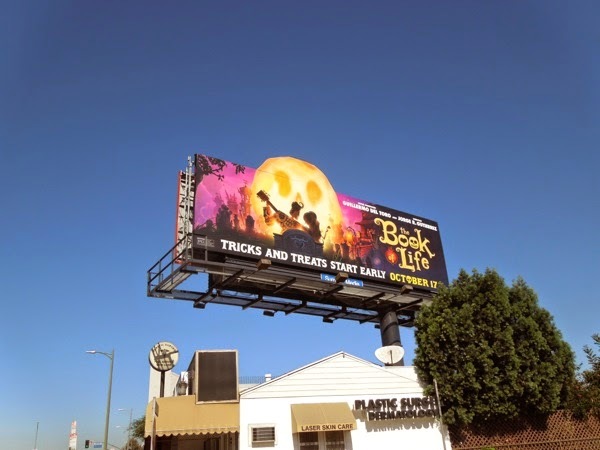 UPDATED: Here's another squarer format billboard for the movie snapped along Olympic Boulevard on October 19, 2014.